When discussing Dracula vs. Cthulhu, people seem surprised when I say it’s science-fiction and then talk about spaceships and time travel. So I’ll say it, again! Dracula vs. Cthulhu is science-fiction horror! So, yeah, don’t be too surprised if it has spaceships and time travel. This is part of the reason to do such a story, right? If I was going to write a story where Dracula was just another Gothic monster, who would care? But the je ne sais quoi is the “vs. Cthulhu.” And Cthulhu? He’s on the sci-fi end of Lovecraft’s works. Further, I process both Cthulhu and Dracula through the lens of my interpretations and preferences. I think Lovecraft was at his best when he was at his most science-fiction-y. Initially, I was hesitant to make it full-bore sci-fi. Dracula is the quintessential supernatural monster. 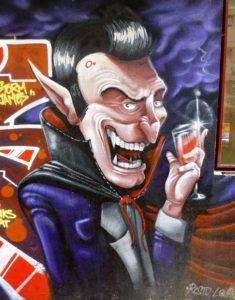 Whether interpreted as a Devil-worshipping sorcerer, overzealous Crusader, or what have you, Dracula is written as a surviving remnant of medievalism intruding into the “modern” world. But when you’re also writing horror in science-fiction, things can get weird. One of the prevailing themes in sci-fi horror – perhaps the dominant theme, and it is certainly true in Lovecraft – is that we might travel far enough away from the safe havens of ordinary reality only to find that the universe is hostile to human life. Whether it is an exploration of the mind, space, time, or alternate dimensions, sci-fi horror is nearly defined by the discovery that we, as a species, are fucked. Whether it’s the horrid finds on cavern walls that feature so regularly in Lovecraft’s work, xenomorphs bursting out of people’s chests, or the creation of a zombie pathogen, the core idea is that exploration trails back nightmares. Into that setting, it is possible to look at Dracula and see him as more than medieval. While his barbarity was indefensible – not simply the cruelty of his daily impalings, but their scope and arbitrariness – we tend to forget that he was as well-educated as could be by skilled tutors in Constantinople. A closer look at his life shows him to be, well, a man of his times, those times being the Renaissance. That he was a multi-lingual, highly religious, and brutal leader who modernized castles both arming them with cannons and redesigning them against cannons. That he had a coherent economic policy to free Wallachia from reliance on the Transylvanian Saxon free cities which controlled all trade into and out of his country. That he was a skilled warrior and strategist, who beat off a numerically superior foe. He was a fascinating man, and sticking him into the medievalist box is a slight to his complexity. To see him as a relic of medieval brutality is itself a relic of Gothic horror’s tension between “modernity” and “superstition.” It’s just the shadow of Bram Stoker, who adapted a historical character for his specific story. My story isn’t a Gothic tale. The tension isn’t between the modern and the archaic; the conflict arises from the travels of humanity placing them in peril – that we have gone too far and learned too much, and will pay for our knowledge. It’s simply that Dracula has been served his bill for the knowledge he has gained, and paid in full. I’m pretty sure this book is going to be badass.